In Spain, more than 8,000 municipalities have been effected by the last 5 years of economic crisis with particular stagnation in building development and unemployment. Upwards of 3.5 million out of 25.2 million of the country’s homes , approximately 14%, are vacant. 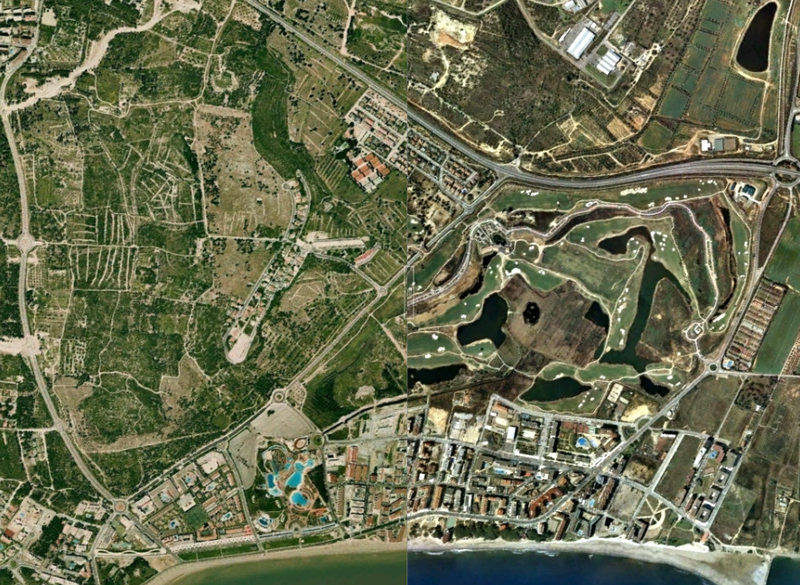 With simple yet stunning before and after satellite images, the Nacionrotonda (Roundabout Nation) is a visual database documenting the change in Spain’s landscape from rural to urban over the last 15 years. An interactive slider offers a time lapse view of each town. The project ,which was started by three civil engineering students, Esteban García, Miguel Álvarez and Rafael Trapiello, has received some criticism, as some feel Spain is not a failure yet a victim, whose tax system was highly dependent on real estate development, and suggest the site tells a ghastly story. Indeed it does, however the project raises awareness about irresponsible housing and infrastructure development. This burst of activity admist an economic collapse turned natural coastal and plains ecosystems into unfinished settlements! The team aims to map/cover all the examples in Spain and seeks user interactive of local communities, so please help them and support their efforts.